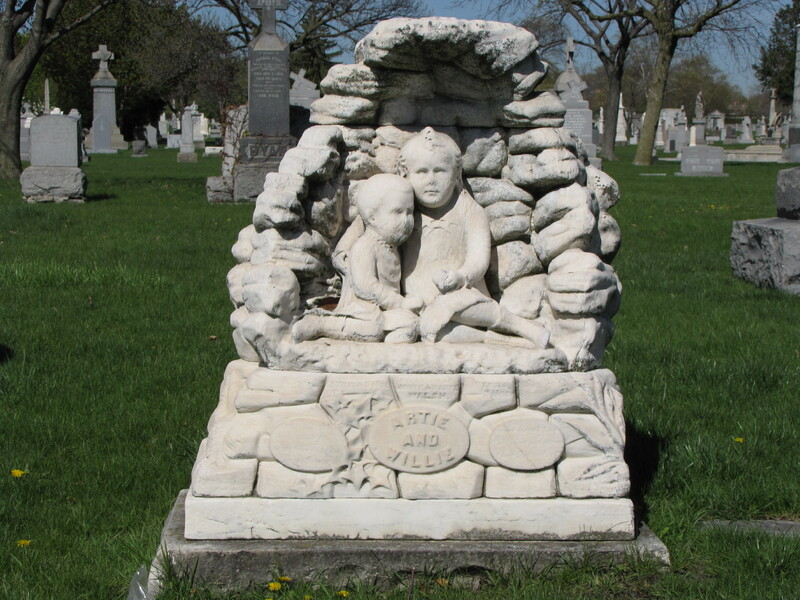 In the Calvary Catholic Cemetery at Chicago, Illinois, there is a gravestone carved to look like a grotto. Inside the tiny grotto are sculptures of two little children. At first glance it might look like two little girls because the children are wearing a dresses, however, that was common for boys up to age five in the Victorian era. The boys were Artie, who was 4 years old, and his brother, Willie, who was 2 years old. They were the sons of John and Marie Walsh. They both died in the late 1800s. Because the soft marble has weathered badly, not much else can be discerned from the inscriptions that have been lost to history. The sculptures have eroded giving the little boys a ghost-like appearance. The older brother’s arm wraps around the younger brother in a tender and protective gesture as they huddle together.